Organizers of 'March of Return' say armed men will protect participants, warn Israel not to take action against the events. Khaled al-Batsh, organizer of the “Marches of Return," warned Israel against harming Arabs participating in the events, hinting that this could lead to a military response by armed groups. Speaking to the Hamas site “Al-Risala,” Batsh said, "We have behind us men and guns who know very well how to protect our people ... Our backs will not be exposed ... We have organizations of struggle that protect the body and they will put an end to any attempt to harm the people and attack it." Batsh noted that the marches will set out on Monday wherever “Palestinians” are found to protest the transfer of the US embassy to Jerusalem. 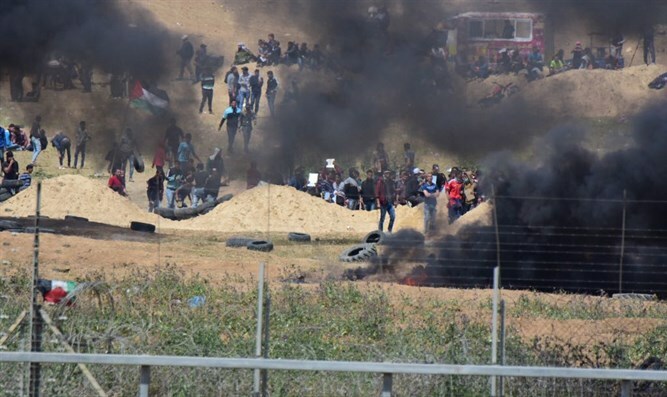 Since the start of the “March of Return” campaign, several terror attacks have been carried out, including infiltrations of Israeli territory.